This essay is an original work by TerryH. Please comment only on the talk page. 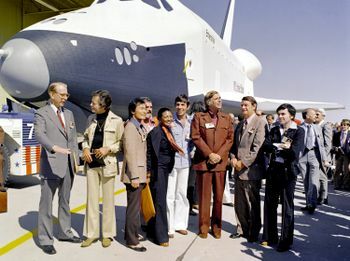 The space shuttle Enterprise, with the then administrator of NASA, the creator of Star Trek, and the original cast posing before it. Fifty years ago this fall (8 September 1966), a new kind of science fiction television show had its premiere. Mr. Gene Roddenberry, who created it, did not rely on dazzling but absurd effects. He left that to his competitor, Irwin Allen. Instead, Roddenberry relied on character development. His show had characters people could not only believe, but love. That single element of the writer’s craft guaranteed the success of Star Trek. No other dramatic franchise in science fiction comes close. Four successor series, a fifth in development, and now thirteen motion pictures, attest to that success. This fall, Star Trek celebrates its Golden Jubilee. Or does it? In fact, though a viewer can believe the characters, he cannot believe the setting. More than the particular setting of a ship of explorers, or a floating fortress, matters here. The world that supports these things should have some grounding in reality. And in many telling ways, the world of Star Trek departs from reality. And it pretends to work, in ways it never could. By many accounts, the Star Trek franchise began to fail in 2006. The most recent three motion pictures might have saved it—but most fans of the franchise dispute this. The reasons for that failure lie beyond scope here. They have to do with the craft of the franchise. Randall S. Ingermanson, author of Oxygen and The Fifth Man, among other works, once defined three things a successful writer or project must have: content, craft and connections. Fans agree the most recent Star Trek show to air, failed miserably at its craft. Viewers stopped watching. Advertisers refused to support it. So executives canceled it, and served notice halfway through the fourth season. Three years later, the producers risked alienating their old fan base. In effect they started over. The last three films play out in an “original series” era radically differently from its original. They have no continuity with most of the five weekly series. But those objecting to this “reboot,” fail to understand that their original vision had fatal flaws. No reboot can repair those. They strike at the heart of politics, economics, philosophy, and theology. These, more even than twisted biology and physics, make this a tarnished jubilee. To be fair, Star Trek didn’t get everything wrong. The original series especially sounded many hopeful notes. More to the point, the producers and writers commented sharply, and justly, on social issues of our era. First they placed a human-alien hybrid, and a woman of color, on the regular bridge watch. This watch also included a Japanese and, beginning in the second season, a Russian. This spoke volumes against racism. So did some of the stories that show told. One features two strangers—white on one side, black on the other, but having the black pigment on different sizes. They fight constantly, and try to play on the sympathies of Captain James T. Kirk and his officers. Those officers eventually visit the home world of these strangers. The strangers’ respective races have annihilated one another. The two strangers disembark, bitter to the end. A sad Captain Kirk leaves them to stew in the juice they and their fellow ethnics boiled up. The Star Trek franchise took longer to discuss the sexism and even misogyny of the original production era. Tragically, one actress, playing a junior officer, did a show in which her captain assaulted her in her quarters. A few weeks later, a studio executive assaulted the actress back-stage. The more ranking executives refused to act. This actress left the show, and turned to drink to deaden the pain. In later years, another generation of executives brought this actress back for two cameo appearances – the likely price of her silence. For reasons she never fully explained, she took the name of the offending executive with her to her grave. As if this did not give enough offense, the last episode of the series featured a woman switching bodies with Kirk. She did this after the “old boy network” at the Admiralty, as she saw it, limited her career choices. This made such sexism, at a critical point in Star Trek “history,” canonical. At least one fan cried “Shame!” on that fact. At least the later shows did away with the last traces of such sexism. The producers designed new uniforms that would show less. They accepted scripts that in some cases reversed male and female roles. And they removed all trace of the “old boy network” of the original series. The show Voyager featured the consummation of this removal. In it, a woman (Captain Kathryn Janeway) held the command, and the lead. Reforms like these do not contradict reality. They enhance society. Despite anything Barack Obama or Hillary Clinton says, most human beings do not appreciate racism or sexism. But the writers of the various shows and films project a supporting “world” that cannot work. Humans have tried many features of it already. Results have varied from less-than-stellar to disastrous. And no one connected with the Star Trek franchise, and few fans, even acknowledge this. Or if they do, they insist such results need not play out. Further installments in this series will examine the failings of Star Trek in detail. The obvious objection—that no extraterrestrial civilization can exist—does not matter here. The allegorical references to society, present and “ideal,” do matter. So also do the more concrete references and projections. In this context, discussion will lead, and concentrate more, on the social or “soft” sciences first. ↑ Clues in the three films that have shown so far, suggest they take place in an “alternate universe.” Parallel universes allegedly multiply with each choice someone makes, or any event subject to random chance. ↑ The Soviet news organ, Pravda, complained about the absence of a Russian officer on board. Roddenberry introduced Ensign Pavel Chekov to address that complaint. But he also played a running joke on Pravda. Chekov always asserted that all high human achievements began in Russia. He made several hilariously absurd assertions along this line. Still, viewers saw a Russian and a Japanese sitting at a combined console. After centuries of war between those two countries, that surely resonated. ↑ Television stations in some Deep South markets—but not Richmond, Virginia—refused to air the show on that ground. ↑ “Let That Be Your Last Battlefield” in the original series. Frank Gorshin and Lou Antonio played the two warring strangers. ↑ Grace Lee Whitney admits she had a drinking problem before the incident. She took one drink. Then she found herself in a locked room with a man not willing to take “No” for an answer. But after leaving the show, she drank more heavily. ↑ “Turnabout Intruder” in the original series. The sudden death of former President Dwight D. Eisenhower forced the network to postpone the airing of this episode for two and a half months. This page was last modified on 8 October 2018, at 21:23.